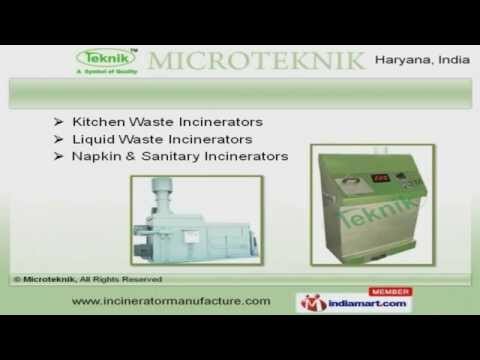 Welcome toÂ Microteknik, Manufacturer and Exporter of Waste Product Incinerators. An ISO 14001 2004 andÂ OHSASÂ 18001 2007 certified company, incorporated in 1973 atÂ Ambala. We have spread our wings to Asian, African, European and other countries. We are well known in the market for our International quality standards, Cutting edge technology and Expedite delivery schedules. We offer a splendid range of Animal, Bio Medical Waste and Electrical Incinerators. Our General Waste, Industrial Waste, Glass and Bottle Incinerators are superior in performance. Our organization is highly involved in providing an impeccable range of Kitchen Waste, Liquid Waste, Napkin and Sanitary Incinerators. We are highly instrumental in presenting a wide spectrum of Oil Fired, Poultry Waste and Rotary Kiln Incinerators. Our clients can avail from us an exquisite range of Waste and Electrical Incinerators for Industrial Wastes that are highly efficient. Unveil a comprehensive range of Kitchen Waste Incinerators for Kitchen Waste and Waste Incinerators for Municipality Wastes that are cost effective.